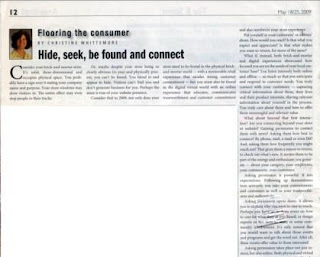 This article about the retail experience appeared in the May 18/25, 2009 issue of Floor Covering Weekly. Consider your brick-and-mortar store. It’s solid, three-dimensional, and occupies physical space. You probably have a sign over it stating your company name and purpose. Your store windows may draw visitors in. The entire effect may even stop people in their tracks. Or, maybe despite your store being so clearly obvious [to you] and physically present, you can’t be found. You blend in and appear to hide. Visitors can’t find you and don’t generate business for you. Perhaps the same is true of your website presence. Consider that in 2009 not only does your store need to be found in the physical brick-and-mortar world – with a memorable retail experience that exudes strong customer commitment – but you must also be found in the digital virtual world with an online experience that educates, communicates trustworthiness and customer commitment and also reinforces your store experience. Put yourself in your customers’ or visitors’ shoes. How would you react? Is that what you expect and appreciate? Is that what makes you want to return, for more of the same? What if, instead, both brick-and-mortar and digital experiences showcased how focused you are on the needs of your local customer base? You listen intensely both online and offline – so much so that you anticipate and respond to customer needs. You truly connect with your customers – capturing critical information about them, their lives and their product interests, sharing relevant information about yourself in the process. You truly care about them and how to offer them meaningful and relevant value. What about beyond that first interaction? Are you connecting beyond your store or website? Gaining permission to contact them with news? Asking them how best to connect? By phone, mail, e-mail or even IM? And, asking them how frequently you might reach out? That gives them a reason to return, to check out what’s new. It invites them to be part of the energy and enthusiasm you generate – about your category, your employees, your community, your customers. Asking permission is powerful. It sets expectations. Following up demonstrates how seriously you take your commitments and customers as well as your trustworthiness and authenticity. Asking permission opens doors. It allows you to explain why you want to stay in touch. Perhaps you have an in-store event on how to care for what they’ve purchased, or design experts or fun facts to share or some community involvement. It’s only natural that you would want to talk about those events and programs and get the word out. After all, these events offer value to those interested. Asking permission takes place not just in-store, but also online. Both physical and virtual experiences must be consistent and reflect the same concern for courtesy. That’s how you set the stage for meaningful connections that lead to a community. Communities are vibrant: members talk to and about one another, share ideas and create new value for one another as you deliver more value to them. Here’s the beautiful aspect of all of these connections. If you’re truly passionate about your business and customers, and truly committed to forging connections and establishing community, not only will you connect with others, but you’ll also easily be found by future like-minded customers when they start to seek out information about your products, and your brand. 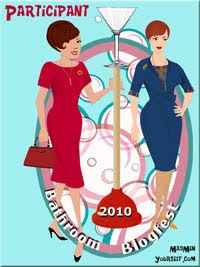 Not only is it more fun, but it’s more profitable. That’s why I say: Hide no more! Be found and connect. I agree that your online experience should be consistent with your retail experience. Like a retail store, I think your site's navigation should be very intuitive so that customers can find what they are looking for without being overwhelmed with information that they don't want. I love your point of a happy customer for life and not just Christmas! The opportunity is huge for retailers who are able to manage the customer experience across multiple channels.